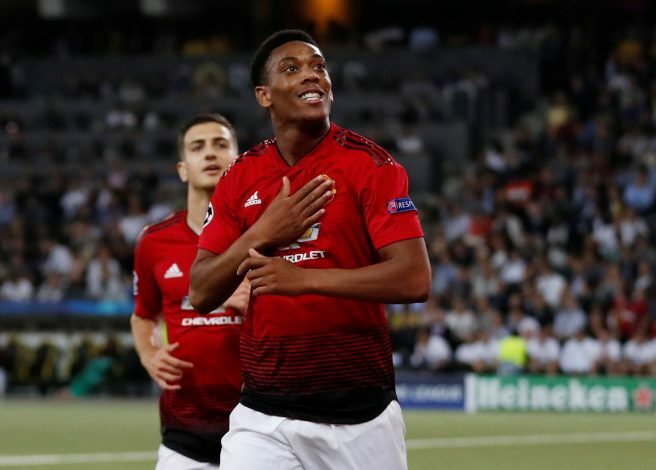 Anthony Martial applauded the Manchester United away fans, who came all the way in the side’s Champions League encounter against Swiss team Young Boys. Martial, who scored the team’s third goal in the 3-0 victory, was the last United player to leave the pitch. He was seen in the section where the away fans were seated, and applauded them. The fans, in return, serenaded him with a song. Martial is one player really loved by the fans, and he has a special bond with them. Despite all that has been going on with his future in question at Old Trafford, this moment will give him plenty to be grateful for. The Frenchman played the entire 90 minutes after being selected ahead of Alexis Sanchez. Although he was wayward at times, the goal – his first of the season – will help him settle his nerves for sure. Anthony Martial last #mufc player left applauding the away fans. He's waited a while for that moment. Paul Pogba goes over and congratulates him. The player also took to Twitter after the match and thanked the fans, claiming they are the best. Martial’s agent had earlier stated that the forward was unhappy at the club, and was seeking a move out. But it was understood that United did not wish to sell him. His inconsistent form was the reason for Jose Mourinho to overlook him last season for most parts. Once Alexis came in, Martial’s role diminished further. Perhaps this goal would help him focus and put in a string of impressive shows in order to be a regular in the side. United need their attackers to come good and help the club go the distance this season.